Add the pork, a few pieces at a time, and brown well. Remove the meat as it browns to a shallow baking dish. Add a little more oil to the pan if necessary. Add the onion and garlic and cook for a couple of minutes until softened. Then add the flour and cook for a minute or two. Add the cider, stirring all the time. Then add the apple, cream, bay leaf and seasoning. Pour the sauce over the pork in the baking dish. Add the garlic and breadcrumbs. Toss together for two to three minutes until crispy. Add the lemon rind, parsley and a little seasoning. When the pork is cooked, taste for seasoning. 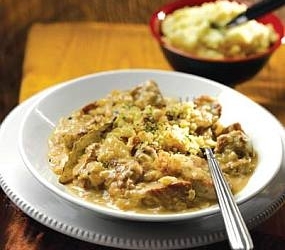 Sprinkle the Garlic Topping over the pork and serve with mashed potatoes with a little wholegrain mustard mixed through them.